Pepin County is a county in the U.S. state of Wisconsin. As of the 2010 census, the population was 7,469, making it the fourth-least populous county in Wisconsin. Its county seat is Durand. 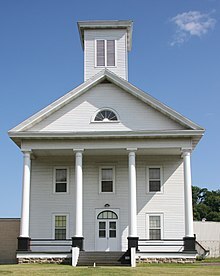 Pepin County is the birthplace of Laura Ingalls Wilder, the author of the Little House on the Prairie children's books. Pepin County was formed in the year 1858 from portions of neighboring Dunn County. Both the town of Pepin (originally named North Pepin in 1856), and the village of Pepin were named after Lake Pepin, a broadening of the Mississippi River between Pepin County, and the Counties of Goodhue and Wabasha in the state of Minnesota. The lake itself is likely named for one or more of the Pepin families from the French Canadian city of Trois-Rivières in Quebec, Canada. Several Pepins appear in the early records records, including the senior figure Guillaume dit Tranchemontagne and his descendants Pierre and Jean Pepin du Chardonnets. It is probable that one or both of the latter accompanied Daniel Greysolon, the Sieur du Lhut, from Montreal to what is now Duluth, Minnesota, in 1679. Exactly when the body of water was first named Pepin is not known, but the name has been used as early as 1700, making it by far one of the oldest recorded place names in Wisconsin. The name was well-accepted by the mid-1760s when Jonathan Carver wrote in his journal, "Arrived at Lake Pepin called by some Lake St. Anthony." According to the U.S. Census Bureau, the county has a total area of 249 square miles (640 km2), of which 232 square miles (600 km2) is land and 17 square miles (44 km2) (6.7%) is water. It is the smallest county in Wisconsin by land area. As of the census of 2000, there were 7,213 people, 2,759 households, and 1,934 families residing in the county. The population density was 31 people per square mile (12/km²). There were 3,036 housing units at an average density of 13 per square mile (5/km²). The racial makeup of the county was 98.90% White, 0.08% Black or African American, 0.19% Native American, 0.21% Asian, 0.04% Pacific Islander, 0.08% from other races, and 0.49% from two or more races. 0.35% of the population were Hispanic or Latino of any race. 41.6% were of German, 13.5% Norwegian, 9.9% Austrian and 6.8% Swedish ancestry according to Census 2000. 95.2% spoke English and 3.4% German as their first language. There were 2,759 households out of which 32.40% had children under the age of 18 living with them, 59.90% were married couples living together, 6.80% had a female householder with no husband present, and 29.90% were non-families. 26.10% of all households were made up of individuals and 13.60% had someone living alone who was 65 years of age or older. The average household size was 2.57 and the average family size was 3.13. 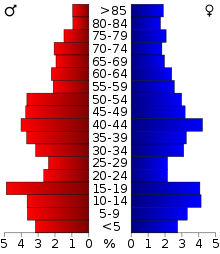 In the county, the population was spread out with 26.50% under the age of 18, 7.90% from 18 to 24, 25.90% from 25 to 44, 22.80% from 45 to 64, and 16.80% who were 65 years of age or older. The median age was 39 years. For every 100 females there were 101.10 males. For every 100 females age 18 and over, there were 100.20 males. Pepin County has a 12-member board of supervisors. Prior to the election of 2016, the last time Pepin County voted for the Republican candidate was in 1972, when voters backed President Richard Nixon (R) over George McGovern (D). Note: In 1928, Progressive candidate Robert M. La Follette, Sr. came in second in Pepin County, receiving 33.59% of the vote (737 votes). ^ a b "State & County QuickFacts". United States Census Bureau. Archived from the original on July 16, 2011. Retrieved January 23, 2014. ^ Callary, Edward (2016). Place Names of Wisconsin. Madison, Wisconsin: University of Wisconsin Press. ISBN 9780299309640. ^ "2010 Census Gazetteer Files". United States Census Bureau. August 22, 2012. Retrieved August 8, 2015. ^ "U.S. Decennial Census". United States Census Bureau. Retrieved August 8, 2015. ^ "Historical Census Browser". University of Virginia Library. Retrieved August 8, 2015. ^ Forstall, Richard L., ed. (March 27, 1995). "Population of Counties by Decennial Census: 1900 to 1990". United States Census Bureau. Retrieved August 8, 2015. ^ "Census 2000 PHC-T-4. Ranking Tables for Counties: 1990 and 2000" (PDF). United States Census Bureau. April 2, 2001. Retrieved August 8, 2015. ^ Pepin County Board of Supervisors Archived 2012-06-25 at the Wayback Machine Retrieved 2011-04-15. ^ Leip, David. "Dave Leip's Atlas of U.S. Presidential Elections". uselectionatlas.org. Retrieved 17 April 2018. Curtiss-Wedge, Franklyn (comp.). History of Buffalo and Pepin Counties. Winona, Minn.: H. C. Cooper, Jr., 1919.